Polysianes Cream of Monoi preserves the skin of photo-aging after sun exposure. 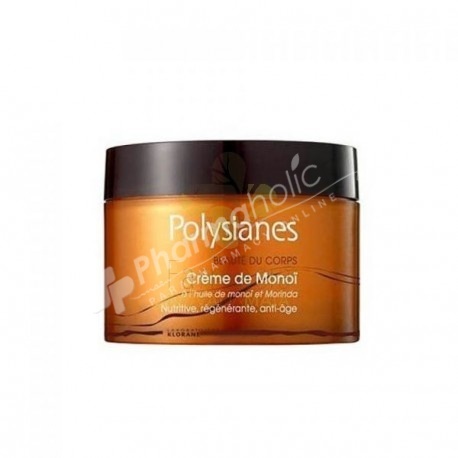 Polysianes Body Beauty Cream of Monoi 200ml is a beauty treatment with Monoi and Morinda oil. Anti-aging, nourishing and regenerating, this cream preserves the skin of photo-aging after exposure. Soft and satiny, the skin reveals a bright tan. After sun exposure, on clean, dry skin, apply Monoi Cream. Aqua, Isododecane, Propylene Glycol, PPG-15, Stearyl Ethe, Isodecyl Neopentanoate, Mineral Oil (Paraffinum Liquidum), Peg-8, Cocos Nucifera (Coconut) Oil (Cocos Nucifera Oil), Glyceryl Stearate, Polymethyl, Methacrylate, Stearyl Alcohol, Batyl Alcohol, Benzoic Acid, Benzyl Salicylate Bht, Caprylyl Glycol, Carbomer, Ceteth-20, Cinnamyl Alcohol, Citronellol, Dimethicone, Dissodium EDTA, Perfume (Fragrance), Gardena Tahitensis Flower, Hexyl Cinnamal, Hydroxycitronellal, Iron Oxides (Ci 77491), Limonene, Linalool, Mica, Morinda Citrifolia Fruit Extract, Sodium Hydroxide, Steareth-25, Titanium Dioxide (C 77891), Tocopherol, Tocopheryl Acetate.